Hello lovely readers. Today I'm thrilled to introduce you to the debut collection from 5-free, stamping nail polish indie maker Moonflower Polish. Continue reading after the jump for the release of The Rainbow Cremes stamping polish collection and the Day and Night duo. • The cremes are carefully crafted by hand in small batches, so small variation in color may occur. • Some of the colors have a matte finish, are highly pigmented, and may stain. • The colors blend nicely with each other so that you can create custom shades or use them for gradients or with nail vinyls. • The polishes are named in Spanish (Nadia is a fellow Puerto Rican!) with the English name in parentheses. • The collection has been designed to be thicker than regular polish, and not really meant to be used as regular polish. For the debut collection, Moonflower Polish is unveiling a 10-piece multi-color creme collection called The Rainbow Cremes. For the first nail art set, I used a stamping plate from Pet'la plates to highlight the ability to pick up fine lines. I also used the original clear jelly stamper. One my accent nail, I stamped with Night (black stamping creme from the Day and Night Duo) over white, and then stamped with the rainbow creme. All nail art was sealed with a glossy top coat. Anaranjado - a bright orange stamping creme. For the second nail art set, I used a stamping plate from It Girl plates to highlight the ability to pick up a pattern that leaves little room for mistakes. I also used a medium soft stamper from FabUrNails. Again on my accent nail, I stamped with Night (black stamping creme from the Day and Night Duo) over white, and then stamped with the rainbow creme. All nail art was sealed with a glossy top coat. Turquesa - a turquoise stamping creme. Nadia points out that this polish does have teeny tiny microparticles of pigment that can be seen in the bottles but they shouldn’t show up in the final stamped designs. I can attest that there were no particles on my final art! I actually did not notice any particles in my sample bottle. This is a white and black stamping creme duo that will also be part of the debut. For this last nail art set, I used a stamping plate from Moyou London plates to highlight again the ability to pick up a pattern that leaves little room for mistakes. I used the medium soft stamper from FabUrNails again. I also stamped a pair of love birds on my accent nail using the Rojo and Rosa cremes. All nail art was sealed with a glossy top coat. Overall, I love this collection. The colors are all gorgeous, and the polishes performed beautifully with a range of stamping plates and stampers. Due to the nature of these polishes and the high pigmentation, you may have some staining around your cuticles. It was more noticeable with the yellow and blue cremes and recommend you use a barrier like liquid latex if you would like to avoid it as much as possible. Please note that I did not use any type of barrier and was still able to remove the excess pigmentation around my cuticles with pure accent. Last, although you may be temped to use these as regular polishes, these were not designed to be worn as regular polish and may stain your nails if you do so. Now for the sales info! The Rainbow cremes and Day and Night Duo will be available for pre-order starting at 9 am EST on the 15th and ending on Feb 17th at 11:59pm EST. Turn around time is 2 weeks until they ship. Prices for the Rainbow Creme collection are $7.50 for the full size 15 ml bottles ($70 for the full Rainbow Creme set of 10); $4.50 for the mini 7 ml bottles, $40 set of 10. Prices for the Day and Night Duo are $7.50 the full size 15 ml bottles ($14 for the set); $4.50 for the mini 7 ml bottles; $8 for the mini set. There is free shipping with the purchases of $50 US or more, use code FREESHIP, only US and Canada at this time. The collection is available here. Make sure you follow Moonflower Polish on Facebook and Instagram to stay up-to-date and for information on upcoming releases. These items were provided for my honest review. All opinions expressed are my own. These all stamp so well. I think I need one of everything! Wow, these stamp beautifully! Love! I can never have enough stamping polishes! Hadn't heard bout this brand but gave them a follow! Love finding new brands! <3 Great art work to showcase their stamping ability! These are gorgeous! I have been needing more stamping polishes to this is good timing if I can work out funds! I am really impressed with these! I need some real stamping polishes in my collection...it really makes such a difference! I'm impressed with how well that orange and yellow stamp over darker colours! Wow, I'm impressed by how well these stamp! The results are just amazing. I love all the manis and the stamping is so clear! 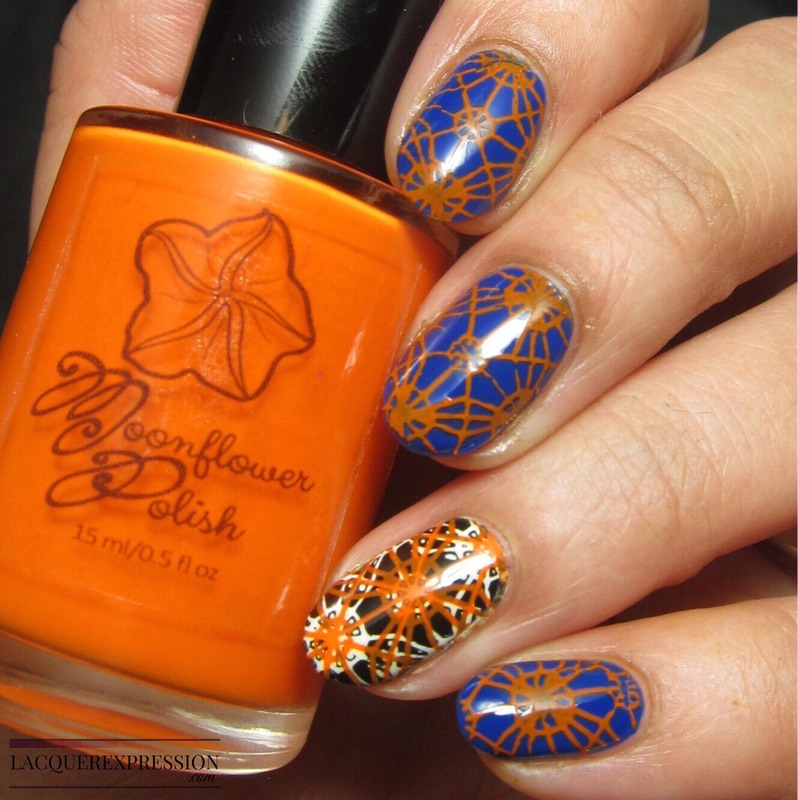 These stamping polishes are perfection! Congrats Nadia! I know how hard she worked on this line so it's so neat to see it come together. I hated when M Polishes left so it's great to see another company fill the void of great stamping polish! Oh my goodness these look fabulous! I'm going to need them allllll!! All of these came out flawless! You nailed these!! I love how Marron looks with that teal!